Continuing on her journey from high school to college while staying in the realm of athletics was something alumni Michaela Babineau felt extremely passionate about when choosing which school to attend. 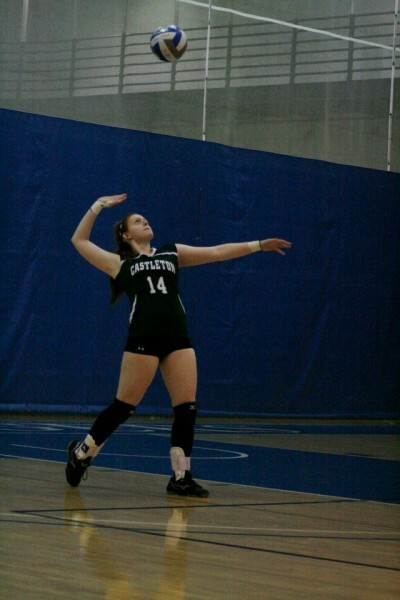 In order to make this dream a reality she declared a major in Athletic Training with a minor in Health, and joined the Castleton Women’s Volleyball team. Although athletics plays a huge role in Babineau’s day-to-day life, Castleton has offered her far more opportunities. “My expectations have been surpassed. I cannot imagine that I could be the young woman I am today without the experiences I have had with my classmates, teammates, and other peers here at Castleton,” she said. The close-knit community of Castleton is an aspect Babineau enjoyed most about the university, along with the hands on experience she’d been given to allow her to grow in her field. Furthermore she had the opportunity to work with all types of athletes and clinicians, which will transition perfectly into her next step in life after Castleton. Babineau plans to further her education and earn a degree in Physician Assistant studies. Helping her along the way has been plenty of great professors and clinicians. According to Babineau they fully supported her in her journeys and given her a variety of clinical technical and personal skills. “This has shaped me as a person to see the dedication these people have for their profession, and their love for what they do every day. I can only hope that one day, I will be able to do the same for other students,” Babineau said. Outside the world of athletics, she was just as involved in other activities across campus. Babineau was a mentor at Castleton Elementary School, a volunteer at the Wonderfeet Museum in Rutland, and a member of the club One in Ten, Castleton's LGBTQ and Ally support group.